Our first impression of San Francisco was dirty, smelly with lot of rough sleepers. Having said that the city grew on us but still a shame to see so many people with mental health issues out on the streets. We will be coming back though. With breakfast included we made the most of it and ate heartily before the first day’s exploring. The cheapest way to get around is on public transport and we bought 3 day Muni passes for $31 each. 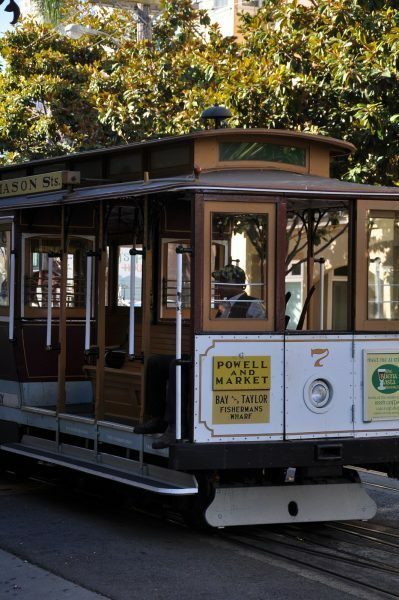 With the cable cars being $7 for a single journey or $20 a day, we soon got our money’s worth. Fisherman’s Wharf was just as the guide books said and very touristy but a great place to people watch which we did over a nice lunch at Alioto. We soon realised that the advertised prices didn’t always include the local tax and tips. 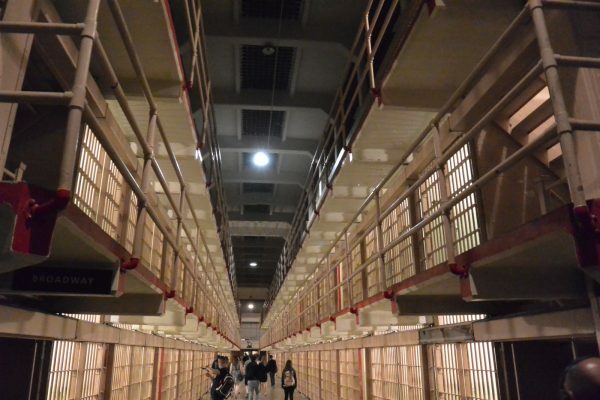 We had booked a night trip to Alcatraz before we left the UK and it is well worth doing. 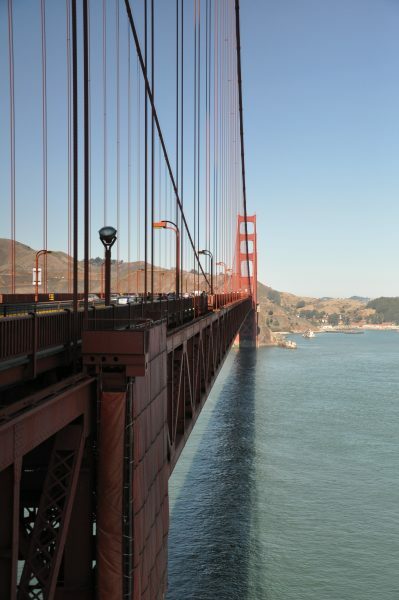 The cost of the trip ($40 per adult) included return boat trip and audio tour and the bonus of the night tour is you get to see San Francisco and all its lights on the return boat trip. A bit of a later start but paid for the lie-in with a 25 minute wait for breakfast. The hotel was very close to the end of one of the cable car lines but there was always a really long queue, so we followed the advice in the guide book to walk to the next stop where the queue was inevitably shorter. Today was to be a cycling day. From the sea front we hired a couple of bikes from Blazing Saddles to ride across the Golden Gate Bridge. Having paid our money we were given a very quick talk about the bike and route and off we went…along with a lot of others from several different companies. At times the bridge was a little congested with both riders and people on foot. Some were totally unaware of their surroundings and you have to keep your eye out for sure. Before we crossed the bridge we stopped for coffee and cake at the Warming Hut. Once over the bridge we carried on to Sausalito, a quaint little seaside town. Lunch, shopping and a large serving of local ice cream killed any ideas of cycling back but luckily plenty of ferries run across the Bay so there was an easy option back to get back the city. The cycle hire cost $36 each with $5 insurance and $10 ferry fees on top (shorter trips can be booked and paid for by the hour). If you decide to cycle back the ferry fees will be refunded. The ferry is really well getting hundreds of bikes on very slickly. 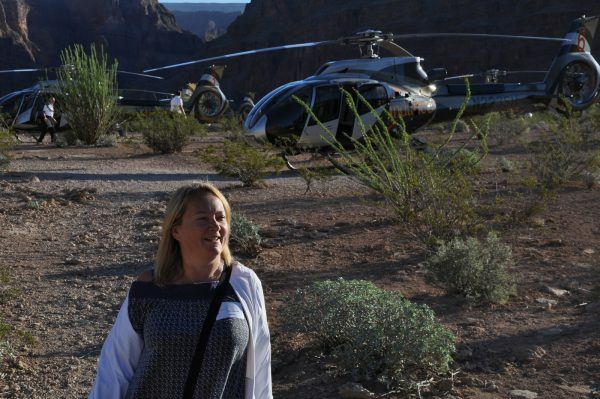 Earlier start to check out and pick up the hire car…. Not just any hire car it was a Ford Mustang Cabriolet. A beautiful car. Maybe I should provide some background to this trip. It is June’s ‘special’ birthday this year and she always wanted to be on a Harley Davidson cruising down the Pacific Coast Highway. However the stumbling block was neither of us can’t ride bikes! However Bob did arrange a trip on a Harley a couple of years ago in the Warwickshire countryside with the help of a mate…well done Rod. With this under her belt she was happy with a convertible for Highway 1. After our first Uber ride to National Car Hire and a quick checkout we were on our way towards the night’s stop at Fernwood Resort a couple of hours south of San Francisco along Highway 1. 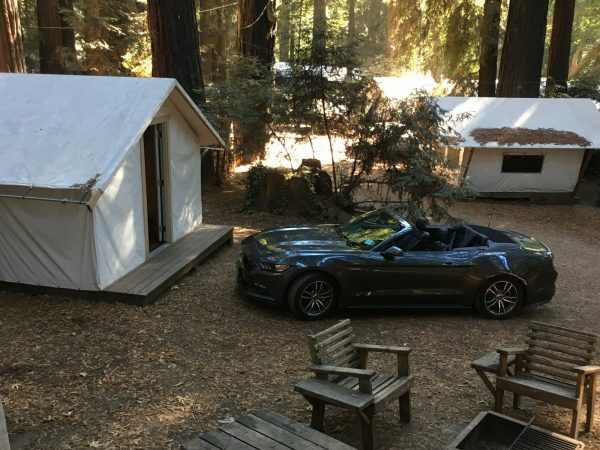 This of course included a few stops for photos and a brief shop before a couple of nights glamping in amongst the redwoods. The riverside site takes tents, motorhomes and caravans and on the site there were a few permanent residents. It also has a bar and restaurant and breakfast stuff and fresh coffee can be picked up at the site shop. The glamping option gave a us a proper double bed, heater, outside chairs, firepit and two clean bathrooms shared between the three glamping tents all of which had parking. We decided to head south further along the Big Sur but unfortunately lots of the park areas were closed due to fires. It’s a fantastic road to drive, all twists and turns dipping in and out of the banks of coastal mist which led to endless photo opportunities. We got as far south as Elephant Seal Beach (the name is a big clue as to what you can see there! ), and stopped at Ragged Point Inn for the obligatory coffee break in both directions. The Nepenthe Café was a worthy recommendation for the final coffee stop with its terraces and their stunning views of the coast. 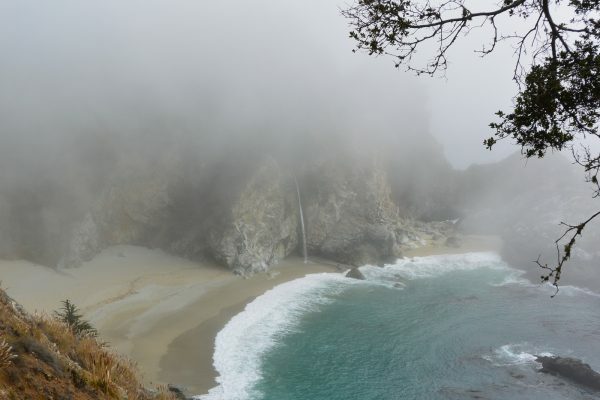 We caught a brief glimpse of the McWay Falls ($10 entry fee) as the sea mist cleared for a few minutes and stopped off at Pfeiffer Beach ($10 entry fee) to see the purple sand…albeit you had to dig for it. Evening meal at Fernwood again which is a great place to stay if a little noisy at times. The Adventure Tents are cleaned daily and the towels are changed. Certainly different and great for a couple of nights! Another early start as we left Fernwood and headed back north to Carmel and then Monterey. We took the 17 mile drive around the Pebble Beach peninsula. $10 to see the big houses but a very scenic coastal drive. We didn’t really stop in Carmel but both really liked Monterey which although obviously catering for tourists, it wasn’t too tacky. Lunch at Sly McFly and June had a sneaky little Margarita. Off then to Marina and the Sanctuary Beach Resort…our one night of full on luxury where we were driven to our room on a golf cart. The beach was right outside our windows… really stunning and a great sunset, albeit a little on the cold side in late September! A late email told us the hotel’s restaurant was closed for refurbishment but we found a nice little Vietnamese that hit the spot in a local strip mall. Busy day! We felt like we were sneaking out as we tried to avoid the over helpful staff – neither of us is particularly comfy with top end hotels. Having dropped off the car at San Francisco Airport, it was then the air train to the terminal where we grabbed our second Uber to take us to Fremont on the other side of the Bay to pick up the RV. Arrived a little early but the staff at Cruise America could not have been more helpful and we managed to get off to a quick start. First impressions of the RV was it was a little ‘willowy’ but Bob soon got used to it. 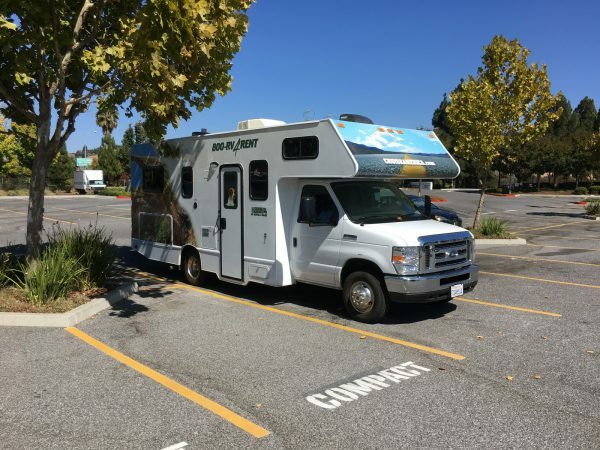 Stopped off at a nearby Walmart, much more of them later, to stock up with ‘stuff’ (as regular motorhomers we just forgot the basics that we always have on board…took a bit of thinking). We had prebooked the personal kits so had towels and bedding and the kitchen equipment so we could eat and drink! With road works and a few detours the total time from Walmart to Yosemite was 6 hours but we had prebooked the campsite so were able to pull straight on to our allocated pitch. We arrived in the dark and had no idea to what was out there for us to wake up to…..
Woke to a neighbour starting their generator up at 7.00. Most sites that allow generators post the hours that you can run them. Typically 7.00 – 9.00 and again 16.00 – 20.00. Our RV package came with unlimited generator use and although we didn’t expect to use it, it did come in handy a few times. We opened the van up to find ourselves surrounded by huge pine trees, clear blue skies and lots of rock faces. 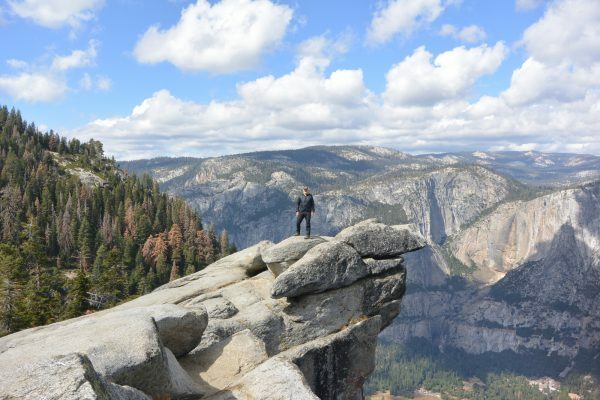 We walked into Yosemite Village and totally gob smacked with the scenery. There was lots and lots of ‘upness’. Very majestic and maybe one or two photos taken! We took the Valley Loop Tour which is on the back of a trailer and guided by a park ranger. It was a really good orientation trip, costing only $25 each and lasting 2 hours. Not something we’d normally do but glad we did and would thoroughly recommend. We used the free shuttles to get around for the rest of the day, visiting the really well stocked Village Store. More fresh food that Walmart! Back to the van where we started our generator to charge all the tech. The campsite we used was Upper Pines, $26 a night with a bus stop just outside the front gate. We did book as soon as the pitches were released though. 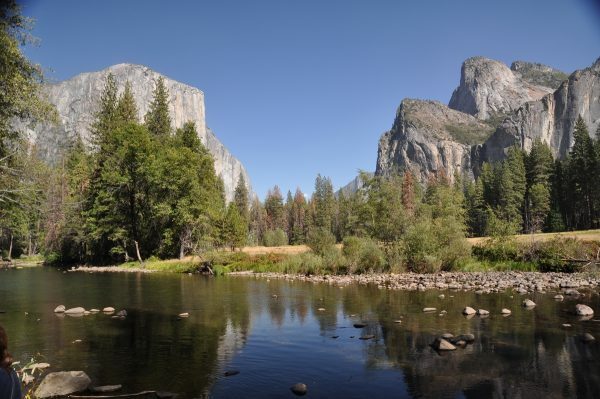 They are up for grabs on the US National Parks website 3 months in advance. Early shuttle through the valley to the trail head for Glacier Point via the 4 mile trail, which is actually 4.8 miles each way although we had planned to come down via a different route. The views from the trail are stunning and we both welcomed the stops to take photos as the track is quite steep. 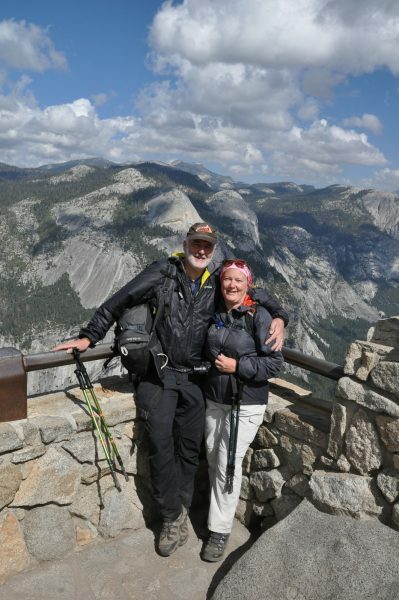 At the top Glacier Point gives views to die for and worth every aching muscle (driving and shuttle options are available for those less inclined to walk!). After a #clewleystopsforcoffee at the café at the top, we started our way back down via the Panorama Trail. Not quite so stunning views, still beautiful though but definitely the harder route. Total walking time 5 hours (double that for the whole day) with 15 miles under our boots including 4000 feet of ascent! Arrived back in the van in the dark, totally exhausted yet feeling exhilarated at what we had accomplished. Despite thinking he was prepared for anything, on the way down Bob felt outkitted when we passed a guy with an ice axe on his rucksack. Not a drop of snow in sight or forecast. As we left Yosemite we bought an Annual National Parks pass for $80 which seems a lot to pay out but it would cover us for all the national (not state) parks we intended to visit and with each park costing around $25/30 it would pay for itself in a couple of days. 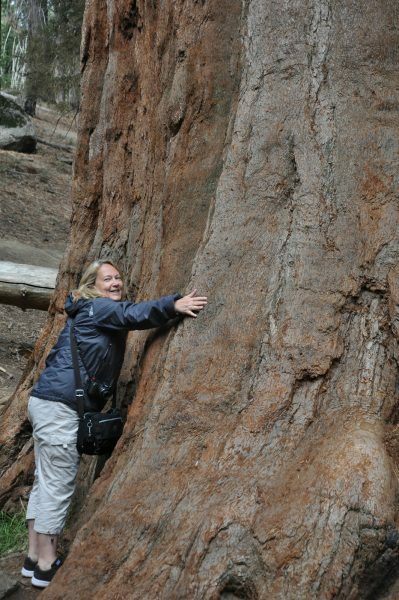 It was overcast and raining slightly as we drove to Kings Canyon and Sequoia to see the really big redwoods; firstly the General Grant tree and then along the General’s Highway to the General Sherman. The size of these trees needs to be seen to be believed but Bob was able to stand fully upright in the trunk of a fallen tree. Vans greater than 25ft long are not allowed to exit the park through the southern gate due to the gradient and twisty road so we decided to find a campsite in the Sequoia NP. Only one seemed to be open which was Lodgepole but it turned out to be a good choice! Hundreds of places, self service check in (something we’d get used – find an empty pitch and drop your money in a safe box), a cafe and a laundry and all for $22. The campsite is at 6,720 ft and with no light pollution we were afforded stunning views of the clear night sky. A long boring driving day (446 miles) although we did go through part of the Mojave Desert and past the Andrews Airforce Base. Having spent the previous few days in the mountains, this was a total contrast. We had three nights booked at the Stratosphere Hotel which has a car park for oversized vehicles so the RV would be fine for a couple of days. Staying on the Strip was just something that had to be done so after a quick dinner in Dennys (free wifi!) there was time for a walk to see the sights closest to the hotel. A lot of the Strip is being rebuilt so there are several huge empty plots. One of a few very early starts of this trip as we were being picked up by limo at 5.30am for our helicopter trip to the Grand Canyon. A stretch limo is not our usual style but totally in keeping with being in Vegas! The helicopter sat six passengers and we were lucky enough to get the front seats on the way out. We left around 7am, flew over Las Vegas, the Hoover Dam and Lake Mead before landing in the Canyon for breakfast. 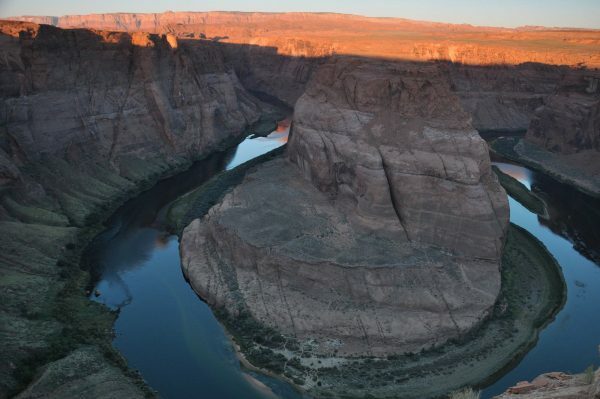 Words cannot describe the stunning views of the Canyon as the sun was rising. The area where we landed for breakfast was a little overcrowded once an another half dozen helicopters had arrived but it was still one of the most awe-inspiring places for our little picnic breakfast. We used Sundance Helicopters and although it was an expensive morning out it was worth every penny. Having got back to the hotel by 10am, we had plenty of time for shopping and with outlet malls at either end of Las Vegas Boulevard we had plenty of choice too. We used the buses to get around with a 24 hour pass costing $8 per adult. The Deuce service runs up and down the Strip but the SDK also goes to the northern mall. After a quick afternoon nap and cocktails from the viewing deck of the Stratosphere it was back on the bus to the far end of town to see all the hotels we had missed the night before. Dinner at the Harley Davidson Restaurant – yes there is a recurring theme on this trip! Part of the reason for staying at the Stratosphere was so Bob could do the jump off the top of it and today was the day. An 855Ft drop attached to a couple of ropes and it’s all over in seconds! $120 or $100 to hotel residents. 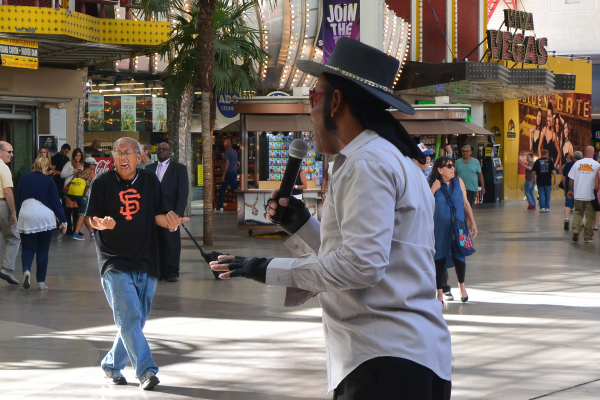 From there we headed downtown to the Fremont Street area which we decide is the US equivalent of Blackpool. The purpose of this visit is to do the Zoom zip wire which runs the full length of the arcade. You are strapped in to a harness Superman style and emerge from a slot machine to fly across the heads of the crowds shopping below. 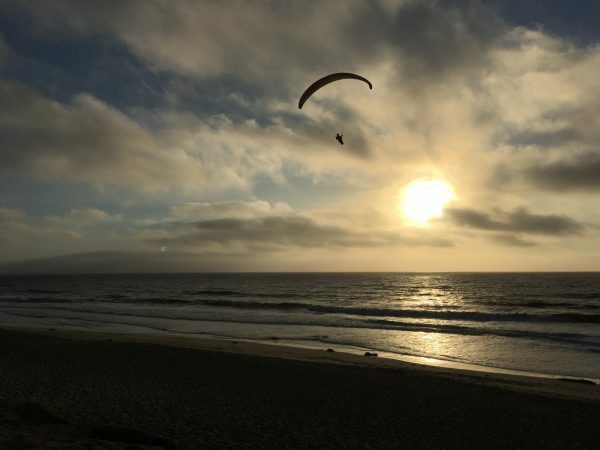 Great fun and $40 for an afternoon “flight”. Then spent a couple of hours at “Whiskey Licker” drinking cocktails whilst listening to an amazing busker who even did “You Make Me Feel Brand New” for us. Dinner that night was at Lotus of Siam, a great Thai restaurant off the Strip which was recommended by one of June’s friends. The food was great and it’s obviously a popular place as we hadn’t made a reservation and had to wait a while, albeit sat at the bar! Left the big city lights of Vegas and drove a short distance to spend the day with friends in Boulder City. 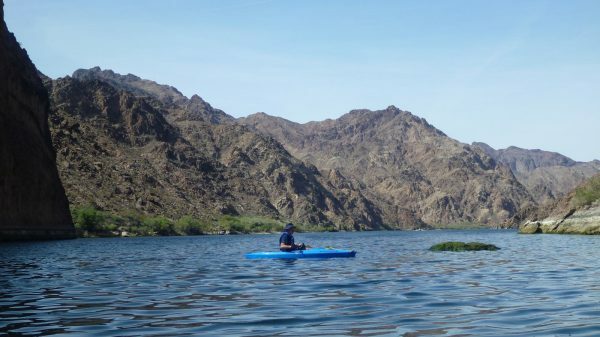 Tony took us out kayaking on the Colorado River and as well a great day out on the water, Tony also gave us some of the history of the river. At one point we got out to walk on the “Catwalk”, one of the original gaugers’ trails from when they were first surveying the river. It was then back to join Marge for an early dinner and a quick tour of the City including a building with a mural painted by Tony. Having seen the Hoover Dam from the helicopter, today we got to drive across it and also view it closer up from the new bridge built across the river. Also saw the “Concrete Critters” (literally as the name suggests, statues of concrete animals!) and the long-horned sheep who live wild on the edge of the city. A fantastic day with two of the most hospitable and welcoming people you could ever meet. Tony has boundless energy and even in his late 70s (we think) he still participates in triathlons and indeed had one the following day. Spent the night at Canyon Trail RV Park where we were dwarfed by the full size rigs you could only find the America and hook-ups to the mains water and sewers. $45 per night with all the facilities except decent wifi. Grand Canyon bound but all via main rounds so no exciting driving! Stocked up on supplies at Safeway where it’s worth getting their membership card (don’t need to be resident) as we saved ovre $35 at the till. Also picked up fuel – we’ve noticed the full prices vary widely and we’d seen as high as $3.29 (at this point) and as low as $2.09 per gallon. Also worth noting that some places charge less for cash. We hadn’t realised it was a three day weekend and hadn’t booked a campsite so we arrived at the entrance to the Grand Canyon to find all the campsites full. 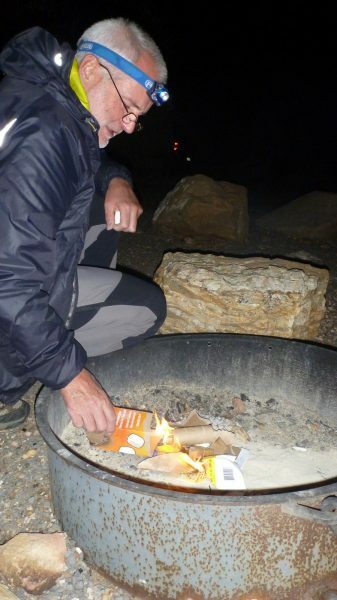 We spoke to a ranger who advised that whilst you cannot “boondock” (wild camp to us Brits) in the National Park you can do so in the surrounding forest. We still went into the Park to get out bearings and stopped briefly at Mather Point to watch the lightning bolts across the Canyon as a rainstorm set in. We found a spot to camp just off the main road to the Grand Canyon (lat: 35.9791, long: 112.1301) and not too high tonight at around 2000m. An easy start as we head straight to Desert View Campsite within the Grand Canyon National Park in the hope of grabbing a pitch as people leave. The plan worked as there are plenty of empty spaces at 10am although it does fill up as the day goes on. Another great little site at $12 per night but no facilities other than toilets (water filling, grey waste dump and toilet emptying facilitites can be found at the main campground and are open to non-residents). 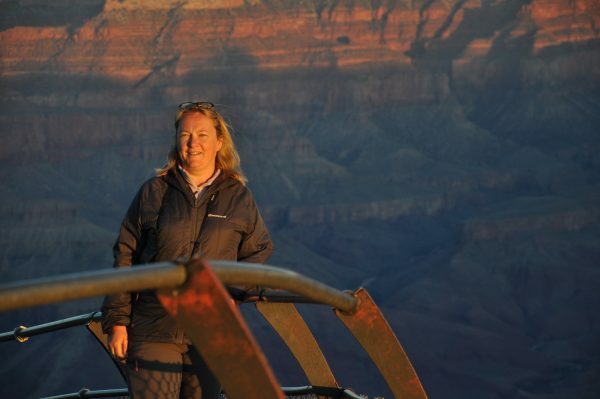 We wondered down to the Canyon Rim and the Watchtower – so many photo opportunities. A quick scoot around the souvenier shop/supermarket and it was back to the van for a relaxing afternoon although as we got back we found a rather large elk grazing by the van! Watching the sun go down later over the Canyon is a must and we get our seats early to enjoy the sunset with a beer in hand. We bought wood for a campfire (all the sites provide fire pits) but as tomorrow will be an early start we keep the wood for another night. 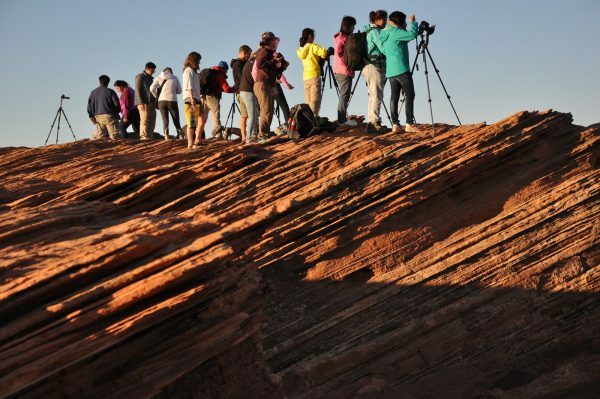 Another must do – watching the sun rise so it’s up at 5.45am to get to Navajo Point. We try to leave the campsite as quietly as possible but that never works and at least we weren’t the only ones with the idea to start early. Got to see the sunrise just before the obligatory influx of Chinese tourists arrived all jostling to get the best photo! We stopped at several viewpoints along the way to the Visitor’s Centre to pick up the shuttle bus to the Bright Angel Trailhead but before that it’s breakfast in the car park. We’ve learned that it’s often best to get to a car park early to be assured of a RV parking place which are often used by cars who can’t be bothered to drive round for a space. 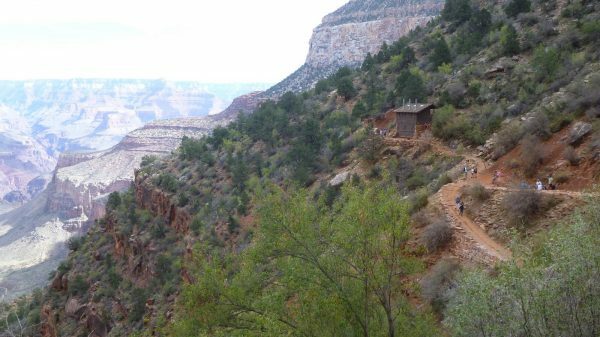 Today we are walking down into the Canyon via the Bright Angel Trail. We’re not going all the way to the bottom but to one of the resting places three miles along the Trail and about 600m down from the rim. That does mean it’s another three miles back up again but it’s not too difficult and the trail is quite busy. A quick shower in the car park (in the van of course!) before heading to the Camping Services area to fill the water tank and empty the grey and black tanks. Desert View to Page – a fairly non-eventful few hours on the road. We picked up fuel and gas in Cameron and then straight to Walmart in Page. Topped up supplies and confirmed it was OK to overnight in the car park. Turns out we weren’t the only ones with that idea as there were at least a dozen vans parked up by the time darkness fell. 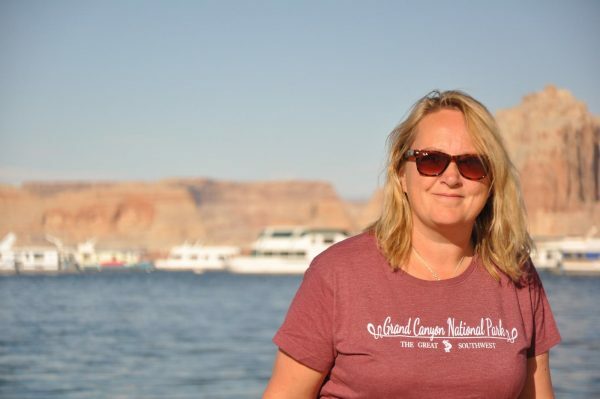 We spent the afternoon around Lake Powell – the Glen Canyon Dam, a few hours by the beach and then up to Antelope Point. Another 5.30am start and this time to get to Horseshoe Bend for the sunrise and we weren’t the first there by any means. Another magical moment! Breakfast in the car park to prepare for the long drive to Moab. We stopped in Monument Valley but as most of the main rock features can be seen for the road we didn’t do any of the tours. We drove through numerous non-descript towns on the 191 and had lunch overlooking Church Rock. We arrived in Moab to find that it stretches for miles along the main road and we quickly lose count of the number of massive RV sites. We finally settle on Sliprock on the edge of the town. It’s $39+tax for the night but it’s a well equipped site and has laundry facilities. 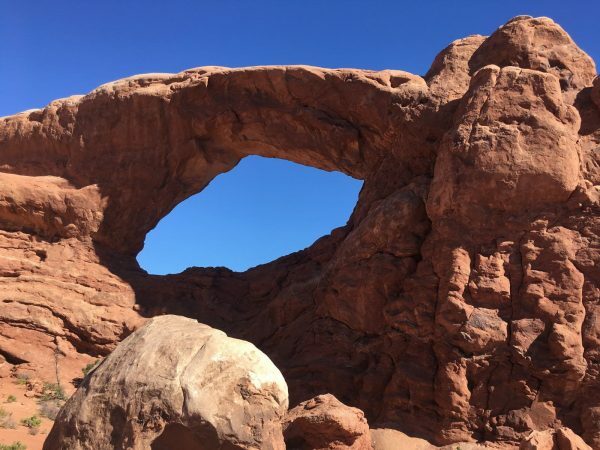 If you like outdoor sports Moab is the place for you as you could find pretty much anything here! 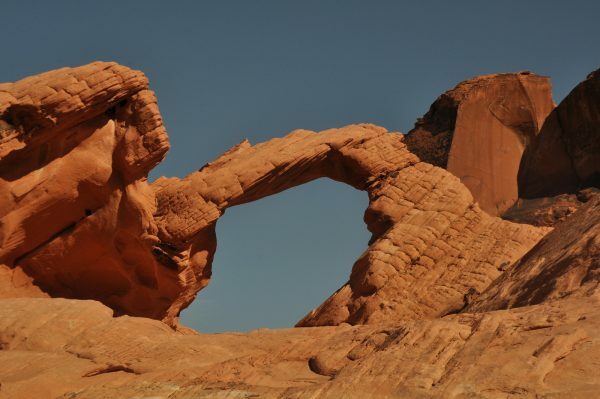 Today’s plan – pop into the National Parks at Arches and Canyonlands before heading towards Brice. Ha!!! 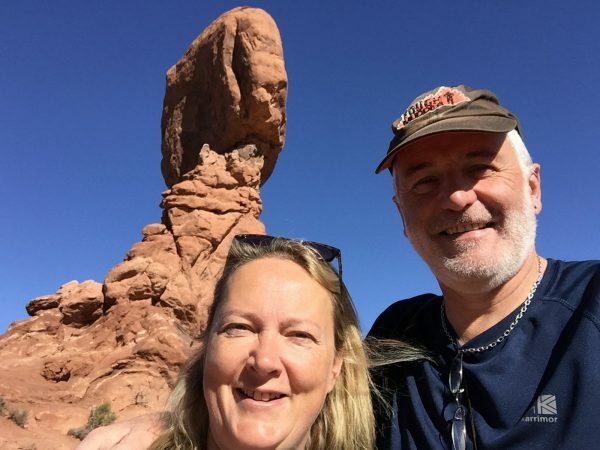 OK a slightly later start as we didn’t take into account the time change from Pacific to Central and a quick FaceTime with Amy back in the UK, so we finally got to Arches about 10am. More gob-smacking moments which neither of us expected and we basically ended up spending the entire day there. 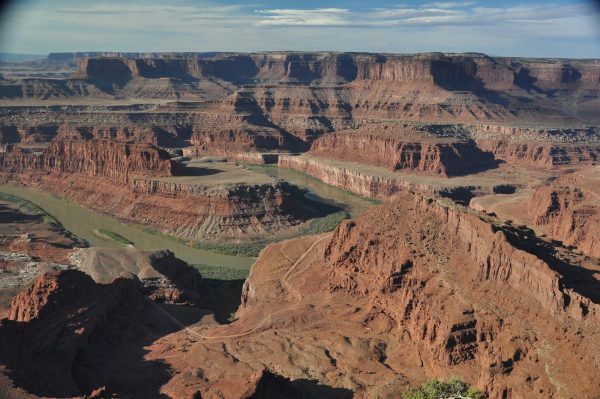 We then drove 50miles or so to find a campsite in the Canyonlands area but they were all full so we ended up back in Moab on the same campsite as yesterday but with no choice other than a fully serviced (ie mains water and sewer again) pitch at $62.62, including tax. We therefore plugged in and charged everything we could! Back on the early starts so on the road by 8.30am. First stop was Dead Horse Point State Park (not covered by National Parks ticket so $10 entry) for stunning views over the Colorado River and gorge. Onto Canyonlands where we used the same approach as we did at Arches – take every right turn and viewpoint to see everything. Totally different scenery here but equally as breathtaking. 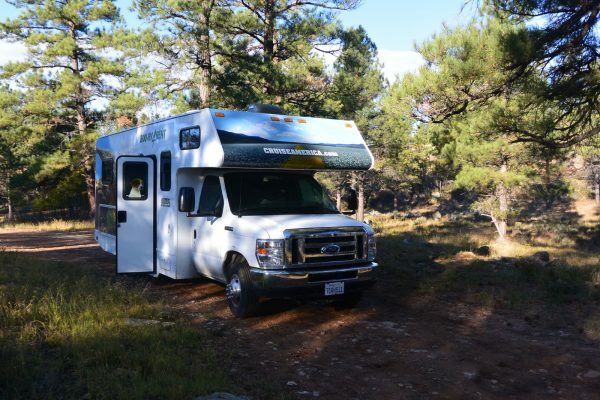 Then hit the road again for a few hours to find a camping spot in the Dixie National Forest. We tried a couple of campsites but they were either full or closed so we ended up wild camping in the trees just off the 12. The scenery had continued to be amazing throughout the whole drive and each tunr bought different views and geology – some of the strangest we had seen. En route we passed through Capitol Reef National Park which is well worth doing of time allows. We continued our drive along route 12 from Dixie National Forest to Cedar City via Bryce. The scenery continued to be stunning, so much so that when we found a geological map of the route a few days later we just had to buy it! Safe to say we had one of out most unique driving moments ever as we drove along the top of a ridge around Escalante with sheer drops on either side! 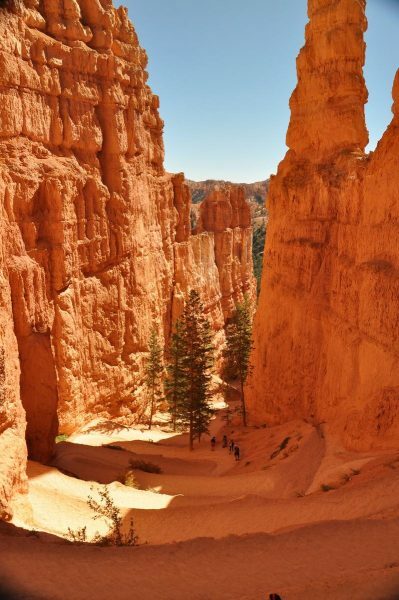 We arrived in Bryce to discover more jaw-dropping yet different geological features as we walked amongst the “hoo doos”. Spent most of the day at reasonable altitude – 9600ft in the Dixie Forest and Bryce at around 8000ft. Tonight’s choice of accomodation was another Walmart car park in Cedar City. We wondered when we arrived why some motorhomes were parked across blocks of spaces rather than in them but as the night progressed and the wind picked up we understood the reason why as a couple of times it felt like we would topple over! We obviously should have followed the local experts lead and parked nose on into the wind. 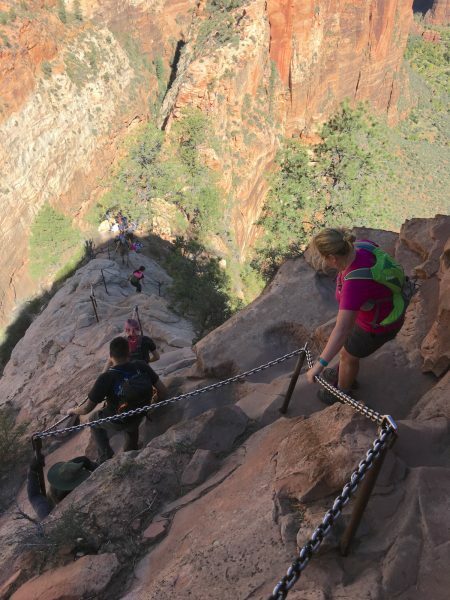 Another early start to get to Zion National Park and walk up to Angel’s Landing before it gets too hot although both of us were shattered after being battered by the wind the previous night! 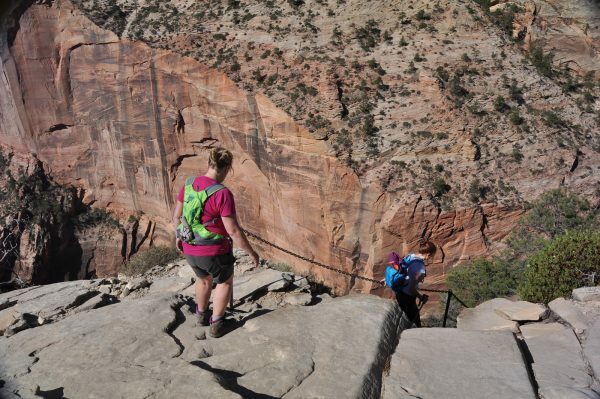 We reached Zion at about 8.30am and the park was already filling up so we headed straight to the shuttle to the trailhead. It ws definitely the best decision to go early as a lot of the trail was in the shade at that point and not as busy as when we came down. We did the chain section to make it to the top without any problems but why do they make all the steps for people with long legs (June not being blessed with them!). The views from the top were as spectacular as we expected! We checked into the Watchman campsite ($30 with electric) but unfortunately there was no space for a second night although we had the option to queue from around 7am for a pitch at the next door campsite the following morning but with no guarantee of a spot. So one night it was to be and after a short nap and some retail therapy we finally had our campfire. With no campsite in Zion National Park for tonight we moved the van to the RV carpark early to ensure a parking place and had a leisurely breakfast there. We took the Park Shuttle Bus to the end of its route for our walk along the Narrows. We normally try to keep our boots dry when walking so it was a bit strange today to walk straight into the river wearing them. 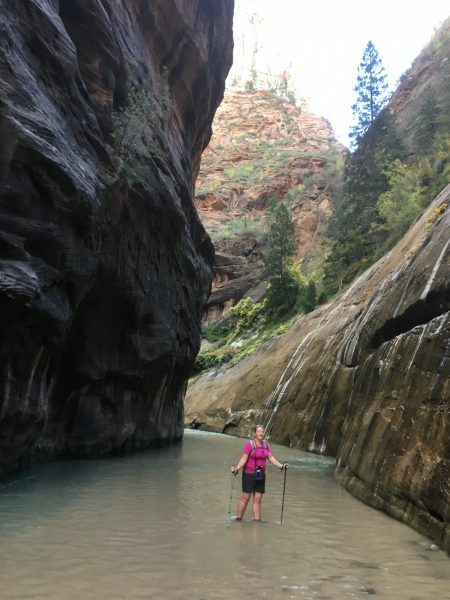 A fun walk and boots aside we managed to stay dry and we then headed back to Zion Lodge to do the Emerald Pools trail. Probably because it was the end of the summer but the pools certainly weren’t emerald coloured – more like a sludge green! We left Zion NP to spend the night a short distance away at Zion River Resort, another huge campsite. $55 inclusive for a fully serviced pitch and pretty good wifi. A driving day going from Zion to Death Valley covering four states – Utah, Arizona, Nevada and California, and mostly on highways for a distance of around 300 miles. 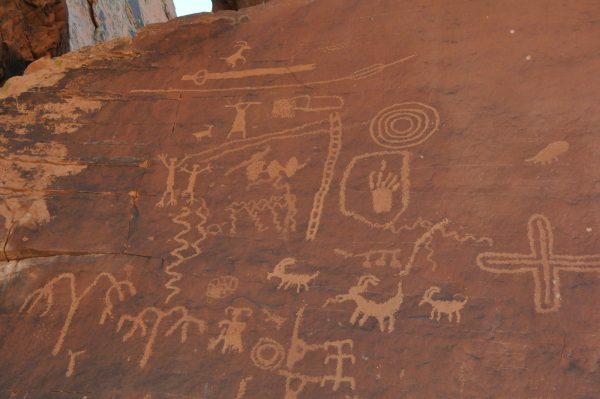 We broke the day up with a visit to the Valley of Fire State Park (entrance $10) where we saw more amazing sandstone features and some petroglyphs. 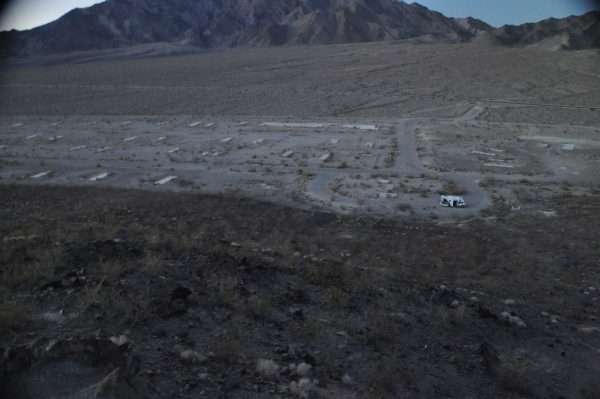 We had booked into a campsite in Beatty but decided to wild camp at a derelict RV site on the way to Death Valley. It was a good choice being surrounded by nothing and nobody and with a clear sky the Milky Way was on full view. Before entering Death Valley we went to Dante’s Peak for an overview of the area and then to Zabriskie Point. 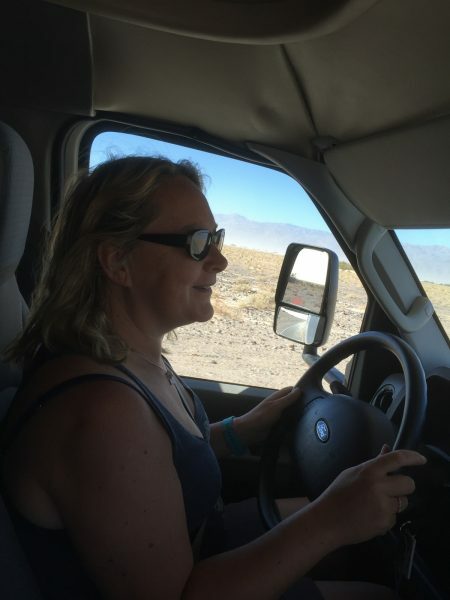 It was then straight to Furnace Creek to check out the campsite options (plenty) before going to the Ubehebe Crater (extinct volcano) where we had an interesting conversation with an American couple regarding the upcoming election. Their comment was that it was a choice of a criminal (Clinton) or a joker (Trump). Well as we know the latter triumphed and time will tell what his legacy will be. 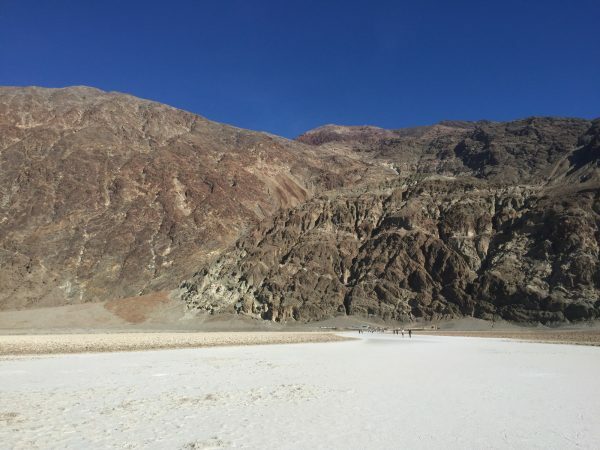 We explored the rest of the Valley via the Sand Dunes and Badwater Basin which is the lowest point at 282ft below sea level. We camped at Sunset campsite just across the road from the Furnace Creek village. $14 per night but no facilities other than water filling and waste dumping (all we really needed). A note re fuel in Death Valley – fuel in Furnace Creek was $3.89 per gallon but a few miles away in Stovepipe Wells is was “only” $2.93. It was quite a distance though before we found another garage. And so the journey back to San Francisco starts but in true Clewley style it will not be the quickest. most direct route! 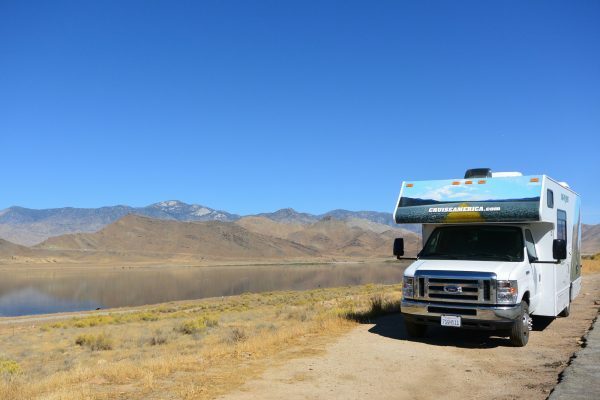 We always have an “old-fashioned” paper map open alongside Tomtom and through this we found a gem of an area around Lake Isabella. We had lunch by the lake and drove another “wiggly” road until we could avoid the freeway no longer! Tonight’s destination is another Walmart car park but for the first time we didn’t feel comfortable at out first stop so we moved on to another, larger store. A relatively short drive (two hours) to our final campsite so before leaving it was into Walmart for some shopping as an extra bag was required to pack everything in (luckily we had upgraded coming home so had extra luggage allowance!). In a bid to delay the big cleaning the session (van was supposed to go back clean to avoid an extra charge and it was definitely going back cleaner than when we collected it!) it was another detour via Bob’s favourite US store – “Bass Pro Shop”. For a UK person, these shops have to be seen to be believed (last time we were here the girls were looking at child size pink shotguns!) but only clothing bought. The final stop was at the Alameda Fairgrounds RV Site and we arrived only to find a dog show in full process! So not only were we surrounded by huge RVs but these ones all had the biggest cages around them for the pampered pooches. This was possibly the worst site of the trip ($40 fully serviced) but it served its purpose and allowed us to clean the van and empty all the tanks. A leisurely start as it was only 30 minutes or so to the Cruise America depot so plenty of time to fill the fuel and gas tanks (the latter at U-Haul) and give the van the final once-over before dropping it back. A smooth handover with only a cursory check and it was then off to the airport for a long wait for the flight – we got there before midday although the flight wasn’t until 19.15 but unfortunately the return time for the van was before 11am and we couldn’t really go into San Fransisco with all the luggage.